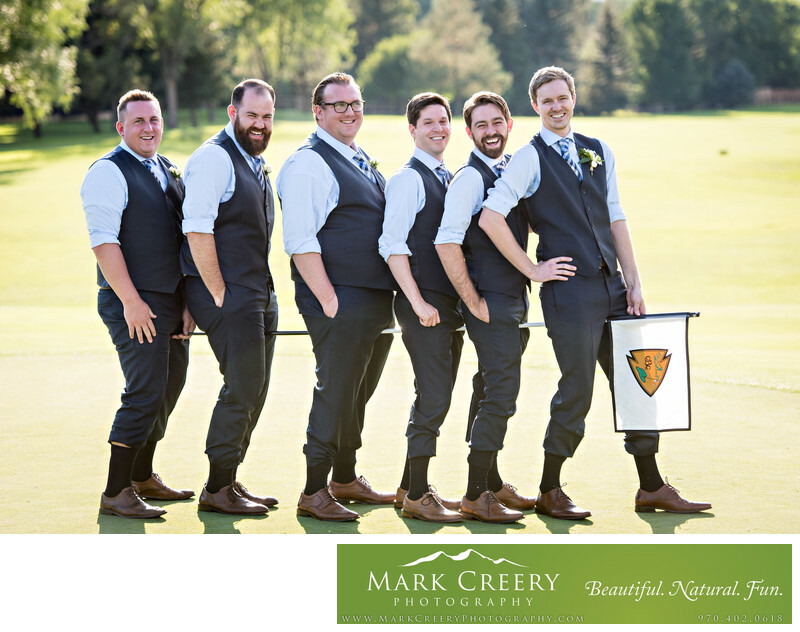 In this cheeky wedding photo taken at the Boulder Country Club, the groomsmen decided to straddle the 18th hole pin for a laugh. They wanted to clown around and came up with this zany idea themselves. I love that they took charge on this, as the photo will have more meaning to the groom when he looks back at this. The bride also got a big kick out of watching them. The Boulder Country Club outdoor ceremony location is nestled between two large trees, that provide ample shade for the guests, which is important in sunny Colorado. There is a nice long lead up for the processional, so it gives time for music and build up, especially as the bride walks up towards the aisle. If golfers aren't on the course you can also walk out into the sun for some mountain views. There are also pretty gardens for some pops of color. The reception venue is classy, with an awesome patio for guests to lounge in during cocktail hour. They also have a suit where the bridal party can get ready and make their entrance to the ceremony from. The Boulder Country Club is located in Boulder, Colorado. Contact: (303) 530-4600, info@bouldercc.org. Location: 7350 Clubhouse Road Boulder, CO 80301.